Urban Decay’s 2016 Summer Collection has arrived and it’s b-e-a-u-tiful. The new range features five permanent products described as their “summer essentials for a natural, radiant glow”. And it’s not surprising that the first product to catch my eye was their Urban Decay Afterglow 8-Hour Highlighter Powder. The new glow getter is available in three shades ‘Aura’, ‘Fireball’ and ‘Sin’; a quintessential champagne highlight and all-round people pleaser. The packaging alone was enough for me to part with my pennies. You can spot the shade through the “UD” fishnet cut-out and the silver compact fits nicely into the palm of my hand and everyday beauty bag. The three Urban Decay Afterglow 8-Hour Highlighter Powders are proving popular and the shade in ‘Sin’ is a light gold highlight with warm undertones and a frosted, semi-metallic finish. And whilst inspired by their bestselling eyeshadow in ‘Sin’, they’re not to be compared as it far less pink. The formulation doesn’t disappoint, it’s finely milled, lightweight, super-soft, creamy in texture and infused with light-diffusing pigments. 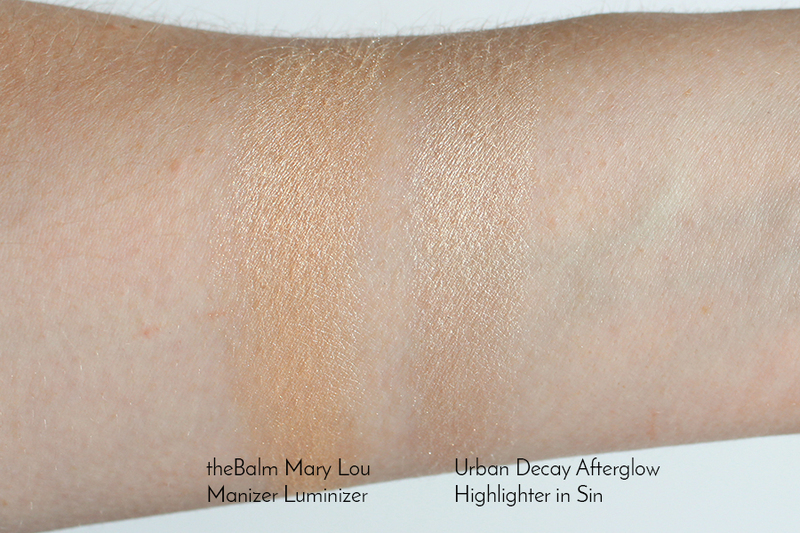 In fact I found the formulation comparable to theBalm Mary Lumaizor, but Mary Lou is less shimmery and warmer in tone. ‘Sin’ is not too flat, or too flashy, meaning it can be worn with a light hand during the day for a subtle glow and come night can be built up to a higher intensity for a full on strobed effect. The shade blends well and is long lasting on the skin, however I find it can on occasion emphasise my pores. So if you’re concerned with your skin texture, you may want to test this in store prior to purchasing. Have you tried anything from Urban Decay's 2016 Summer Collection?